NOVEMBER 2018 THE SHOP 17 T he largest automotive aftermarket trade show may prompt you to act differ- ently than you would at a regional event or consumer show, but in reality the fundamentals of how you work them are all the same. Accumulating business cards is not the way to gauge the success of any outing. However, turning them into solid business connections is, and here's how to go about converting them. KNOW WHO & WHAT YOU ARE When you read a shop's description of itself on its website or in the SEMA Directory, how many say that they are an amalga- mation of a rod shop, 4X4 specialist and performance center all rolled into one? More importantly, could you tell a manu- facturer you're hoping to do business with what you do in less than 30 seconds? Just as you would if you took a public speaking class, try standing in front of a mirror and repeating your statement of who you are and what you do over and over. While you may have the experience and capability of doing several things well, it's what your suppliers think you are that determines whether you become their dealer. One shop known for building customs and street trucks would like to shift its emphasis to lifted trucks, Jeeps and SUVs, but unfortunately its name doesn't lend itself to being an off-road outfitter. 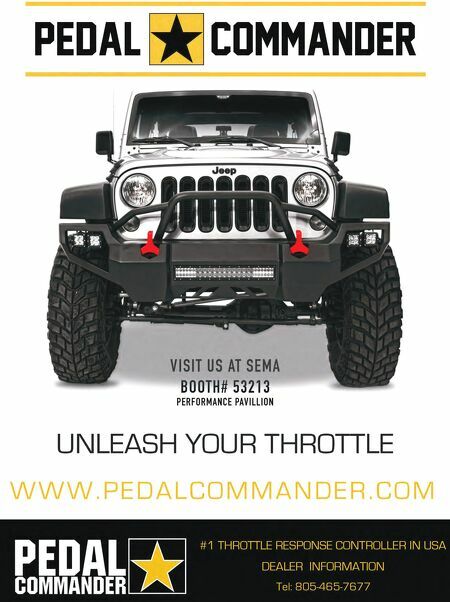 This is just the opposite for an off-road shop that wants to expand into other market niches and has contemplated changing its name to reflect its ability to cater to the needs of many different types of enthusiasts. In both cases the shops were successful in building their businesses with the names they chose originally, but now they've either outgrown them or find that they are limited by the notion that a custom shop can't build lifted vehicles, or that an off-road shop that services DIY enthusiasts and racers in many different forms of motors- ports can't do so with Off-Road in its name. Your shop name notwithstanding, if a company that makes lowering kits for trucks was looking for someone to be their representative in a two-state area, for instance, it probably doesn't need to know that you have an in-house dyno or paint facility. Its main concerns are that you've lowered a number of vehicles in your market and your customers are happy with the work you've done, and the profile of your shop matches what it's looking for in terms of your attention to detail, shop appearance, web presence and other factors. If you have no showroom and your waiting area is disgusting, it's likely you won't be any supplier's first choice to sell and install its products. In short, make sure manufacturers know exactly what it is your shop does. 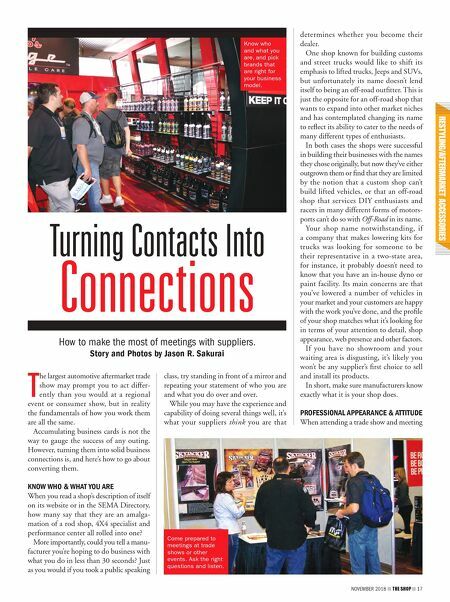 PROFESSIONAL APPEARANCE & ATTITUDE When attending a trade show and meeting Turning Contacts Into Connections How to make the most of meetings with suppliers. Story and Photos by Jason R. Sakurai Know who and what you are, and pick brands that are right for your business model. Come prepared to meetings at trade shows or other events. Ask the right questions and listen.